The collapsed road repair on the edge of Sunter River, Jalan Raya Sodong, RT 03/15, Cipinang Urban Village, Pulogadung, East Jakarta is targeted to be completed next week. The road was collapsed up to 30 meters length and 1.5 meters depth on Sunday (2/18).
" 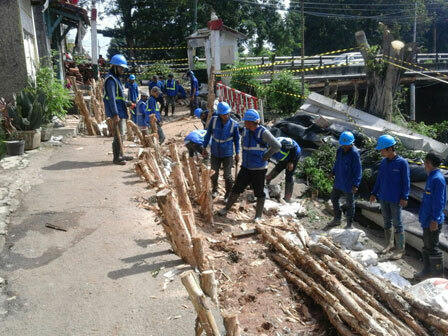 We only make temporary road repairs"
Based on the information in the field, Monday (2/19), around 30 freelancers under East Jakarta Water Resources Sub-dept. were sent to repair the road. They put up a foundation with dolken wood for a subsequent collapse. East Jakarta Water Resources Sub-dept. Head, Mustajab stated foundation installation is temporary. It aims to anticipate unwanted things, like landslides and subsequent collapse. "We only make temporary road repairs. That is by installing the foundation and then compacted with sandbags. This is to avoid subsequent collapse," he stressed. If its installation is done, it will be continued with sheet pile installation through Ciliwung-Cisadane Flood Control Office (BBWSCC). "We only help temporary security to anticipate subsequent collapse," he stated.